The start of another summer, the weather uncertain but no longer sharply edged, and I am pregnant again. In front of me is all the ordinary and useful disarrangement of my desk and beyond it the rain-smudged window with a view across our garden to where my daughter plays, watched over by Johannes. She has begun to lose, lately, the tumbling immediacy of toddlerhood. I notice it when we walk together, our strides separate, or when we sit face to face across a table—how she is taller now and straighter, and inflects her actions with intent. Once her thoughts broke like weather across her face, but that readable plasticity is gone and she is not so transparent: complexity has brought concealment. The weight of her body when I lift her takes me by surprise, its unfamiliarity a reiteration of the distance between us. She used to clamber over me, her legs, around my waist, her arms around my neck, as though I were furniture or an extension of herself, unthought-of or intimately known. Now she stands apart and I must reach for her, on each occasion a little further until it seems her progress towards adulthood is a kind of disappearing and that I know her less and less the more that she becomes herself. This is how things out to be, her going away while I remain, but still I think that if I could then I might reach across to where she stands, outlined against the violent yellow mass of a forsythia bush, and pull her back to me, to keep her always in my sight so that she might be nothing more than the sum of what I know of her. Every 20 pages or so after that, reading at night in bed, I would tell my wife, This book is incredible — I’m stunned. Nathanial Rich’s whole-issue article in the NYT Magazine. I read it in one punch-in-the-gut gulp on a car trip unusually free of kids and other responsibilities. Can’t recommend it more highly. Wonderful. Need to rewatch Moonlight. That’s how code happens in 2018. The process used to be the sort of thing people did in slow and ad hoc ways, a few times a year, and only after a lot of infighting over email. Now the same process might happen 10 times a day, and the infighting is right there in the pull requests. Hundreds of people might be working on one code thing or 10 people on 100 code things. GitHub makes that doable. I can’t imagine life without it. I’d much rather tell a newbie to get a GitHub account than suggest she read the git manual. If all companies are becoming software companies, GitHub is a primary enabler. A truly fun aspect of Microsoft’s acquisition of GitHub is that it was announced before Apple Inc.’s Worldwide Developers Conference. This is like when Passover overlaps with Easter in New York City. The WWDC, sacred nerd summit of Appledom, is where they announce things like a new “night mode” for the operating system and try to convince programmers that Apple Watch matters. But GitHub is nerd infrastructure. Huge portions of modern culture—Google’s TensorFlow machine-learning software, for instance, and even other programming languages, such as Mozilla’s Rust—run on code managed there. For Microsoft to trot this out during WWDC is a real thunder-stealer. It’s nice to see global-platform capitalism played with a little verve. Leadership St. Louis is a highly respected program for established and emerging leaders who have demonstrated a deep commitment to improving the St. Louis region. The 9-month curriculum explores such issues as economic development, racial equity, education, poverty and social services, arts and culture, and the criminal justice system. Participants visit key sites in the bi-state region, engage in face-to-face dialogue with regional decision makers and gain a deeper understanding of leadership approaches that produce results. I'm impressed with those I've heard from who have completed the program, as well the fellow participants I met at last week's orientation. Should be an exciting nine months. In April of 1992, Nada Rothbart was living happily in Sarajevo, Bosnia, with her husband and two young sons–till the night the Bosnian Civil War broke out on the street in front of her home. By the time they recognized what was happening–it was too late; Nada was trapped with her children, surrounded by tanks and snipers. After 60 days with almost no food, no water, and no power, a surprise ceasefire was announced. Nada put on her shoes, grabbed her children, and walked out the door. A wonderful conversation with an enduringly impressive thinker and writer. And those four “lost” novels predicted by the great man's theory all those years ago? If I had followed the great man's advice and never burdened myself with the gift of my children, or if I had never written any novels at all, in the long run the result would have been the same as the result will be for me here, having made the choice I made: I will die; and the world in its violence and serenity will roll on, through the endless indifference of space, and it will take only 100 of its circuits around the sun to turn the six of us, who loved each other, to dust, and consign to oblivion all but a scant few of the thousands upon thousands of novels and short stories written and published during our lifetimes. If none of my books turns out to be among that bright remnant because I allowed my children to steal my time, narrow my compass, and curtail my freedom, I'm all right with that. Once they're written, my books, unlike my children, hold no wonder for me; no mystery resides in them. Unlike my children, my books are cruelly unforgiving of my weaknesses, failings, and flaws of character. Most of all, my books, unlike my children, do not love me back. Anyway, if, 100 years hence, those books lie moldering and forgotten, I'll never know. That's the problem, in the end, with putting all your chips on posterity: You never stick around long enough to enjoy it. A superb and insightful essay on language and family. "Old Woods and Deep: Traces of Cormac McCarthy's Knoxville" — A rare deep dive into McCarthy and in particular Suttree, my favorite novel of his. Columbus (A) — Unique and sensitive debut with such lovely and surprising architecture. Lomelda, "From Here," — Stumbled on her via Spotify Discover. The last-third build-up gets me singing. Chimamanda Ngozi Adichie on "Discovering America" — On this recent New Yorker Radio Hour interview with David Remnick, Adichie was incisive and funny. Moved me to pick up Americanah, which I'm reading now. Slow Burn — Binged-listened to this podcast about Watergate. Hard to believe. Saint Louis Symphony Concert Family Concert — First time taking Leo, who looked up with wide eyes at Powell Hall's magnificent ceiling. It was a treat that the special guest was the 442s, friends and collaborators on this Forest Park Forever project. A week since going, Leo's been loudly 'conducting' in the kitchen. 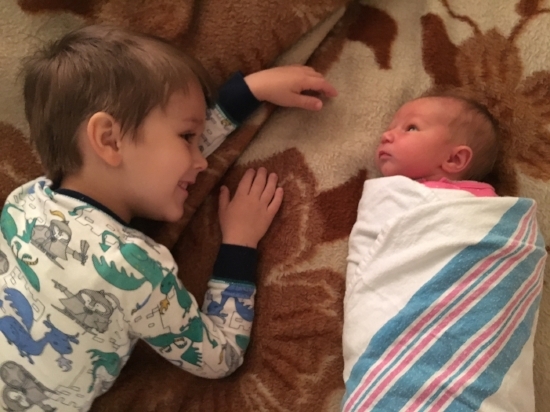 Let's start with the best thing that happened to my family this year, which is the arrival of Sylvia Huremović Schenkenberg in late April. We're still smiling at her the way Leo was above, just a few days in. 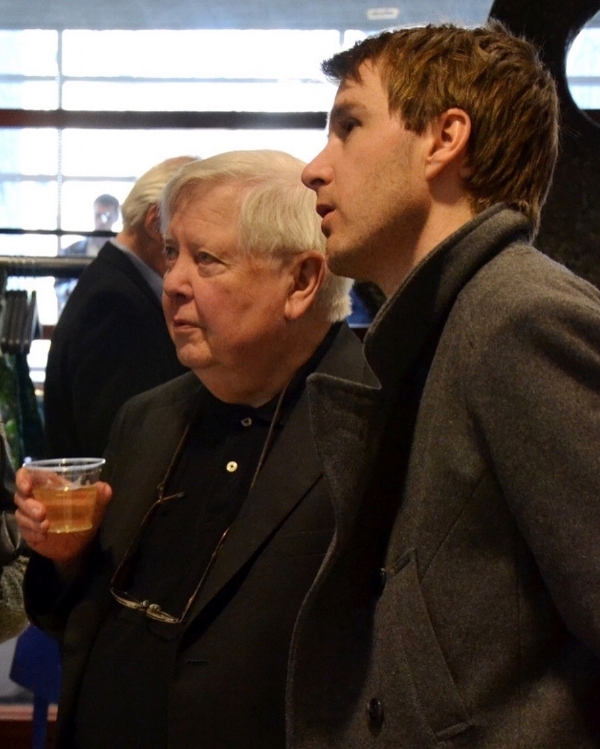 As noted on this website earlier this month, I was sad to see an end to the remarkable life of William H. Gass, who I was lucky enough to get to know over the past decade-plus. Bill lived a long and productive life, dying at 93, and working through his final year. I was honored to write briefly about him for the St. Louis Post-Dispatch and speak about his life and work on St. Louis Public Radio. I continue posting notes from readers and admirers at ReadingGass.org. Highlights from a very fun year at Forest Park Forever include engaging the public in the final year of Forever: The Campaign for Forest Park's Future, speaking at the international City Parks Alliance conference in the Twin Cities, launching a 2.0 version of ForestParkMap.org, and publishing Forest Park: Snapshots of a St. Louis Gem. I was honored to join Lorin Cuoco last week on Don Marsh's "St. Louis on the Air" to discuss the life and work of William H. Gass. The audio is embedded in the station's obituary. I wrote a short piece for the St. Louis Post-Dispatch this past Sunday. A great fortune of my life has been to know this once-in-a-generation writer and be transformed by his work. At ReadingGass.org, I've begun sharing the many memorials coming in, including the St. Louis Post-Dispatch obituary, which includes a few comments from me. I send my deepest condolences to Bill's wife, Mary, and their entire family.